First inside for 2; another milestone for Let's Ring! This performance is linked to the events Let's Ring! — Peals and Quarters and Gloucester & Bristol Diocesan Association — WUE Branch 2018. 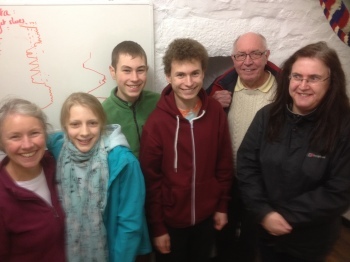 Left to right in ringing order: Catherine, Zoe, Alistair, Ben, Paul and Rachel. Last updated Saturday, 13 January 2018 at 20:24:08. First submitted Saturday, 13 January 2018 at 15:33:25 by Alistair White-Horne. Sent for publication in The Ringing World on Monday, 12 February 2018 at 10:16:40, and printed in one of issues 5575, 5576 or 5577. This performance has been viewed 584 times.